(Park Chan-kyong with Jerome Cartillier in Washington, AFP) Seoul – North Korea said Friday it was still willing to talk to the United States after President Donald Trump abruptly cancelled a summit between the two countries, a decision that has thrown the Korean peninsula once more into uncertainty. In a personal letter to Kim, Trump announced he would not go ahead with the June 12 summit in Singapore, following what the White House called a “trail of broken promises” by the North. Pyongyang’s immediate reaction to the sudden u-turn was conciliatory. First Vice Foreign Minister Kim Kye Gwan called Trump’s decision “unexpected” and “regrettable” but he left the door open for further diplomacy. “We again state to the US our willingness to sit face-to-face at any time in any form to resolve the problem,” he said in a statement carried by the state-run KCNA news agency. Just before Trump announced the cancellation of the talks, North Korea declared it had “completely” dismantled its nuclear test site, in a carefully choreographed move portrayed as a goodwill gesture ahead of the summit. But the chances of success for the unprecedented face-to-face had recently been thrown into doubt. “Sadly, based on the tremendous anger and open hostility displayed in your most recent statement, I feel it is inappropriate, at this time, to have this long-planned meeting,” read Trump’s letter to Kim, which was dictated word for word by the US leader, according to a senior White House official. South Korean President Moon Jae-in called the move “shocking and very regrettable” as he scrambled his national security team. Seoul’s foreign ministry said US Secretary of State Mike Pompeo phoned his South Korean counterpart Kang Kyung-wha Friday morning and said the two nations should continue efforts to “create conditions” for talks with Pyongyang. Separately, Unification Minister Cho Myoung-gyon said Seoul would continue talking to Kim’s regime which he said “remains sincere in implementing the agreement and making efforts on denuclearisation and peace building”. UN Secretary-General Antonio Guterres urged the parties to keep talking, as did host Singapore, while Russia’s President Vladimir Putin held out hope that dialogue would resume and the talks would eventually take place. Washington has made it clear it wants to see the “complete, verifiable and irreversible denuclearization” of the North. 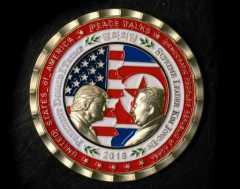 A senior White House official said Pyongyang had demonstrated a “profound lack of good faith” in the run-up to the summit — including standing up the White House’s deputy chief of staff, who had travelled to Singapore for preparatory talks. “They waited and they waited. The North Koreans never showed up. The North Koreans did not tell us anything — they simply stood us up,” said the official, speaking on condition of anonymity. The White House viewed North Korea’s objection to a routine US-South Korean joint military exercise — and its recent cancellation of a meeting with the South Koreans — as a breach of its commitments leading up to the summit. It also was unhappy about the North’s failure to allow international observers to verify the dismantling of its Punggye-ri test site, the staging ground for all six of its nuclear tests which was buried inside a mountain near the border with China. But the North’s Kim Kye Gwan countered that their angry statements were “just a backlash in response to harsh words from the US side that has been pushing for a unilateral denuclearisation”. Experts warned that cancelling the meeting could have knock-on effects. “South Korea is also likely to be angered… Expect Seoul to try to continue engagements with Pyongyang, even if it widens a rift with Washington,” Abraham Denmark, director of the Asia program at the Wilson Center think tank, wrote on Twitter. Democratic congressional leader Nancy Pelosi was scathing towards Trump’s administration — blaming a lack of preparation for the summit collapse and judging Kim to be the “big winner”.